Temperatures are beginning to drop, and the feeling of fall is in the air. In Arizona, that means a lot of fun is just beginning! See our list of fall fun that can be had this year in the weeks leading up to Halloween. Presented by Roosevelt Row Community Development Corp., highlights restaurateurs offering Chile pepper-based cuisine. There is also music, cooking demonstrations, kids’ activities and a talent show. Details: Saturday, October 1, 5:00 PM – 10:00 PM. Second and Roosevelt streets, Phoenix. Free admission (online registration encouraged to guarantee admission). Tasting tickets: $2 or 12 for $20; beer and margarita tokens $5 or 5 for $20. Details: Saturday, October 1, 3:00 PM – 11:00 PM. AJ Chandler Park, 3 S. Arizona Ave. $10 presale at Bashas’; $12 presale online; $15 day of event. A pumpkin patch, hay rides, gold panning, pumpkin painting, food and live music is only a hint of what you can expect at Harvest Fest 2016! Every family gets a free pumpkin. Details: Every Saturday and Sunday of October, starting October 15, 9:00 AM – 5:00 PM. Pioneer Living History Museum, 3901 W. Pioneer Road, Phoenix. $10 adults, $8 children, free for children under 2 years. Discounts online. Admission includes a 7-acre corn maze, mini hay maze, one barrel train ride and one tractor train ride. Families can also enjoy the petting zoo, duck races and a giant jump pad. Marked pumpkins for sale are priced by size and variety. Hay bales and corn stalks are also available to buy. Details: October 1-November 6, 9:00 Am.- 9:00 PM. Monday -Thursday; 9:00 AM – 10:00 PM Friday-Saturday; 10:00 AM – 6:00 PM Sunday. Vertuccio Farms, 4011 S. Power Road, Mesa. Pricing: $9 per person ages 2 & younger free. Season passes are available for $25. Enjoy the fresh farm air during the annual Pumpkin and Chili Party. Every Thursday through Sunday this October, families can enjoy hayrides, a petting zoo, corn mazes and dog shows. Gypsy Time Travelers, a storytelling husband and wife duo, will be performing at the festival for the first time this season. The party also includes amusement rides, a rock-climbing wall and marshmallow roasting. Train and pony rides, food and pumpkins are available for an extra cost. Details: October 1-30, 10:00 AM – 9:00 PM Thursdays and Sundays; 10:00 AM – 10:00 PM Fridays and Saturdays. Schnepf Farms, 24810 S. Rittenhouse Road, Queen Creek. $18 at the farm; $15 at Fry’s Food Stores. Make it an unforgettable fall season this year at Tolmachoff Farms. Let the memories begin and experience the ultimate holiday outing where there is something for the whole family: Great big pumpkin patch, 6-acre family corn maze with a new theme every year, mini corn maze (perfect for the little ones), haunted corn maze (Do you have the courage to enter?). Other activities: petting zoo, train ride, hay pyramid, corn box, adult/child pedal cart track, jumping pillow and much more. Details: October 1- November 6, Closed Mondays. Noon – 8:00 PM Tuesday-Thursday; noon – 11:00 PM Friday; 10:00 AM – 11:00 PM Saturday; 10:00 AM – 8:00 PM Sunday. Tolmachoff Farms 5726 N. 75th Ave, Glendale. $10.00 each ages 2 & up. The Arizona State Fair first appeared in 1884 and has been operating for 132 years. Head out for family entertainment, animals, food, rides, top-notch concerts, exhibits, motorized events, rodeo and more. Details: October 7-30. Noon – 9:00 PM Wednesdays and Thursdays; noon – 10:00 PM Fridays; 10:00 AM – 10:00 PM Saturdays; 10:00 AM – 9:00 PM Sundays. Arizona State Fair Ground, 1826 W. McDowell Road, Phoenix. Admission is $10 adults; $5 children ages 5-13 and seniors. At the Desert Botanical Garden, one of the Valley’s favorite places to find that special pumpkin, take an authentic hayride out to the Garden’s pumpkin patch, where each day children 12 and under can choose their own free pumpkin. Attempt the hay bale maze, decorate your pumpkin and visit the Community Garden to see how pumpkins and vegetables grow. Test your skills on carnival-style games, dance to folk, country and bluegrass music, and meet adorable farm animals. Details: October 21-23, Friday 8:30 AM – noon; Saturday and Sunday 8:30 AM – 3:00 PM. Desert Botanical Garden 1201 N. Galvin Pkwy, Phoenix. Children under 3 are free, event is included with regular Garden admission. Families are invited to come and participate in the Dia de Los Muertos Festivals. Masked entertainers and musicians will entertain with performances in music, dance and theater to honor our ancestors and celebrate our heritage and traditions. A gathering of artists and families. Details: October 23, Noon – 6:00 PM. Steele Indian School Park Memorial Hall, 300 E. Indian School Rd., Phoenix. Free admission. Howl-O-Ween includes activities and experiences for the whole family. Looking for scary tricks? SCARY activities are for guests eight years and older who like a good scare! Sweet treats more your style? MERRY activities are appropriate for all ages. Enjoy character meet-and-greets, magic shows, carnival games, the trick-or-treat trail and so much more. Details: October 28 and 29, 6:30 PM – 10:00 PM. Phoenix Zoo, 455 North Galvin Parkway, Phoenix. Tickets: $10 Member; $12 General; Kids 2 and under are free. Details: October 1 – 31 every Friday and Saturday from 7:00 PM – 11:00 PM. Tolmachoff Farms, 5726 N. 75th Ave. Glendale. $17 each, any age. Not recommended for those under the age of 10. Anyone aged 15 or younger must be accompanied by an adult. One of Arizona’s longest running Haunted Houses, the Crypt and Asylum return with all new SCARES to torment those who dare enter! Three attractions at one location, The Asylum, Chaos, and the Crypt. Details: September 30 – October 31, Times vary by date, check webpage. Fiesta Mall parking lot, 1445 W. Southern Ave, Mesa. Ultimate Fright Pass: $25, both Haunted Houses + Maze; Single Haunted House: $18; CHAOS MAZE Only: $5. This year Sanctum of Horror introduces The Breach so scare searchers can visit two haunts at one location. For 7 years, Sanctum of Horror has been scaring the East Valley with breathtaking make up and incredible detail that will surely frighten the soul. Not only will you be terrified, but be immersed in the Sanctum’s world. Will you have what it takes to enter? Details: September 30 – October 31, check website for specific days and times. Superstition Springs Center, 6555 East Southern Avenue, Mesa. A ticket to both haunts is $22; a ticket to each individual haunt is $15. Fear Farm is the largest outdoor haunted attraction in the valley. 30 acres of pure terror, consisting of 5 indoor/outdoor haunted attractions (Slaughterhouse, Undead, The Bunker, Mouth of Madness, and Legends: Goatman) and for the faint of heart they offer a 10-acre corn maze. New for 2016, Fear Farm brings you the all new Phoenix Haunted Hayride. Guests won’t have to travel far to leave the city lights behind and enjoy this ominous oasis of the desert, the Valley’s only outdoor Halloween experience with attractions for the whole family. This Halloween season, Fear Farms promises to become your family’s newest and most frightening fall tradition: Come for the fun, stay for the fear. Make a night of it. Details: September 30 – October 31, days, times and admission vary. Check website for more information. Fear Farm Haunted Attraction, 2209 N. 99th Avenue, Phoenix. In most buildings, the 13th Floor does not exist. This Halloween Season, explore the legend of the 13th Floor at one of the most horrifying haunted house experiences ever, the 13th Floor Haunted House! The world famous 13th Floor is back in Phoenix for the 2016 Halloween Season! Created by nationally recognized and award winning haunted house designers, the 13th Floor will transport you to new levels of horror. Prepare to be terrified by two epic haunted attraction walkthroughs for one all-inclusive price: “The Deadhouse” and “The Frenzy.” The 13th Floor is an intense, graphic, theatrical show that will take you on a gut wrenching ride of visceral thrills and psychological horror. Sixty thousand square feet of shocking twists and horrifying turns are waiting for you at 13th Floor Haunted House! Details: September 30 – November 12, days, times, and prices vary, visit website for more information. 13th Floor Haunted House,2814 W. Bell Rd., Phoenix. 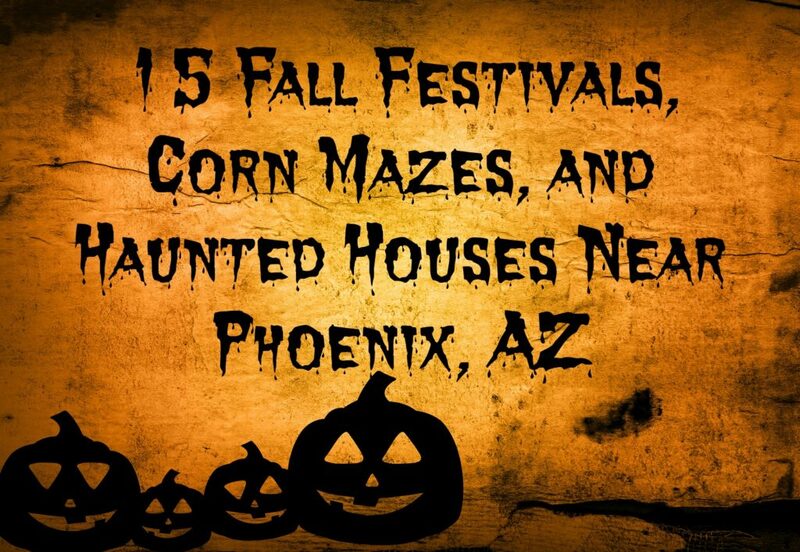 More fun fall festivities across Arizona can be found on the Visit Arizona webpage.